Captain Dustin Brown had a goal and two assists and became only the 2nd American-born captain to ever win a Stanley Cup. 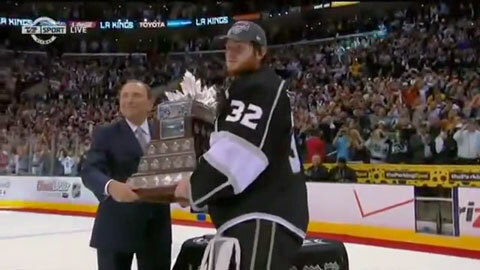 Jonathan Quick, goalie and MVP winner of the Conn Smythe Trophy, made 17 saves in an incredible performance for the Kings. Jeff Carter and Trevor Lewis scored two goals apiece, making the LA Kings the first eighth-seeded playoff team to win the Stanley Cup. Fans have been waiting 45 years for the Kings to bring a championship home and last night they were not disappointed. Two of the best known past LA King players are “The Great One”, Wayne Gretzky and hockey great, Luc Robitaille. Wayne Gretzky is generally considered the greatest hockey player of all time. Luc Robitaille is now the president of the LA Kings business operations. The Los Angeles Kings are his team, his town, his family, his heart. He came home simply because he wanted his team, his town, his family, his heart to experience the rapture that comes with claiming the most cherished trophy in hockey. “One of the main reasons I wanted to be involved with this team is I wanted to have an opportunity to be part of the team if and when it happens,” Robitaille said. Robitaille made it to the NHL in 1986, helping the Kings make the playoffs, despite having a 31-41-8 record. Robitaille scored 45 goals and had 39 assists in 79 games, edging out the Philadelphia Flyers’ Ron Hextall for the Calder Memorial Trophy, the only Los Angeles player ever to win the award.